Gasoline Direct Injection – BG Products, Inc. Gasoline direct injection (GDI) was first used in 1925 on the Hesselman engine. Jonas Hesselman designed the engine to start on gasoline and then switch over to run on diesel or kerosene. But in 1952, Bosch developed the first automotive direct injection system that actually ran on gasoline. Mercedes Benz wasn’t far behind in 1955 with the first direct injection sports car, the 300SL. Due to its high cost, few automakers adopted GDI to be used in mass-market cars. GDI sort of disappeared from the automotive scene until its comeback in late ’90s models of Mitsubishi, Toyota, Nissan and Renault. Through the 2000s, many automakers such as Ford, Volkswagen, GM and BMW began trending toward the direct injection engine due to its significant design advantages. What about today’s GDI engine? Soup it up with a flex fuel capacity, super high output (SHO), 3.5L twin turbocharged EcoBoost® V6 engine and you’ve got Ford’s 2009 Taurus GDI model. Today, most fuel-injected engines use indirect fuel injection that premixes the fuel and air in the intake manifold. With direct injection, however, the air still flows into the cylinder from the intake manifold but the fuel is sprayed into the cylinder separately. GDI is known to be a more expensive system, so what is the value over indirect injection? Take a look at these advantages. The disadvantages for the GDI system are few but can be catastrophic if they’re not closely monitored. These disadvantages present opportunity for BG. We’ve found that regular maintenance using BG products can keep these problems to a minimum. For model year 2009, GM is offering direct injected engines in 10 models in North America, 18 worldwide. For the 2010 model year, GM will have direct injected engines in 38 vehicle models worldwide, with 18 models in North America alone. In the next five years, Ford plans to have at least 500,000 cars a year powered by GTDI engines – that is, Gasoline-turbocharged-direct-injection. CSM Worldwide, a global automotive forecasting and advisory firm, estimates GDI technology to be in 21 percent of new gasoline engines in European-built cars by 2013. 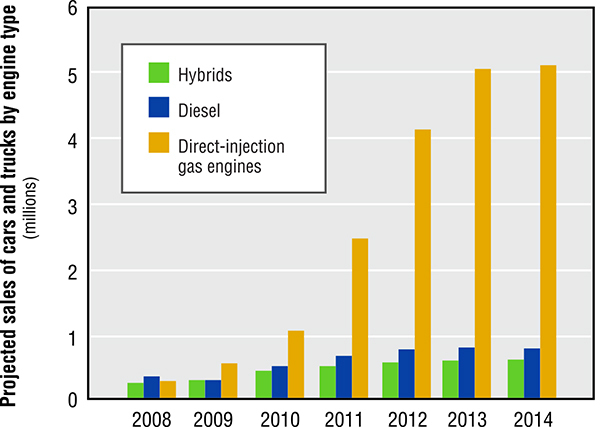 CSM also projects sales of vehicles using direct-injection gas engines will jump to 5.1 million by 2014 from 585,000 in 2009. It’s safe to say GDI engines will be around for a while – and BG will be there to help keep them clean. In fact, we’ve taken a proactive approach to solving GDI deposit problems by purchasing our own test vehicle: a 2010 3.5L Ford Taurus SHO with an EcoBoost® engine. Follow BG’s test vehicle and learn more about GDI technology at BGFuelTest.com.